Some sports appeal to people of all ages; tennis is one of them. One of the most beloved "life sports" tennis is a great game for families for a variety of reasons. Everyone in the family from small kids to grandparents, may enjoy the game and with the possible exception of rural dwellers, locating a court is usually a simple enough thing to do. While some activities require a great deal of gear, tennis players need only a racquet, some balls, and a place to play. Children can begin learning the game at very young ages, often as early as two to three years old, making tennis a great choice for families looking for activities that can include all members. Formal lessons are available for youngsters, but many parents find that they enjoy providing basic instruction for their children. Older siblings who have been playing tennis for a few years can also help little ones to develop a love for the game. Tennis courts are often available as part of health clubs and many community centers. Facilities may be located indoors, outside, or both, but even families who have trouble locating proper tennis courts needn't let that stop them from taking up the sport. A paved driveway with a net strung across will suffice and in a pinch, even the net could be considered optional for at-home practice sessions. As with all sports, practice makes perfect, so kids can look for opportunities to hit a tennis ball - even up against a wall (which, unlike an inexperienced partner, will always return the ball!). Parents who wish to find qualified tennis teachers for their children should begin by asking friends and relatives for recommendations -- the opinions of previous clients can be quite valuable is determining whether personality and teaching style are in line with parents' wishes. 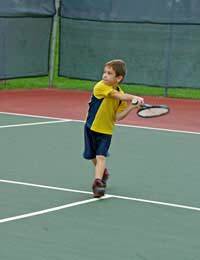 Ideally, tennis coaches should teach game rules and provide basic racquet techniques to young students while keeping the focus on fun, fitness, and good sportsmanship. As kids progress, winning can be a priority (but never more important than playing with ethics! ), but young kids shouldn't worry too much about the competitive aspect of the game. Tennis can be played as a singles game, with two players on the court, or in doubles, allowing four children to play at the same time. Both types of games are good for kids, building strengths in varying ways. Singles games require kids to cover their entire side of the court, helping them to develop quick reflexes, agility, and a powerful backhand stroke. In doubles, kids must work with their partners to claim victory, cooperating and responding quickly to the movements of their partner. Tennis is a social game, so playing is great for the healthy development of children, encouraging their ability to relate well to peers and gain respect for not only their own, but the athletic capabilities of their friends. When families play tennis together, they not only get great workouts, but hopefully develop healthy habits that they will continue throughout their lives.